Cabinet photo of middle-aged woman identified simply as Mrs. Cook. The photo was taken by Fenner's Art Gallery of Westfield, Wisconsin. 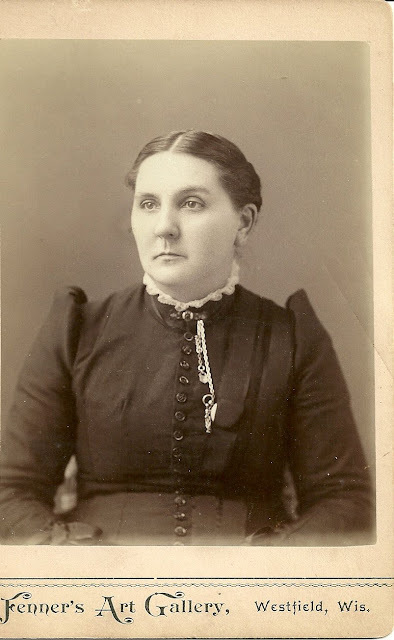 It's possible this is the Ida Cook who appeared on the 1900 Census for Westfield, Wisconsin. If so, her husband was Albert, and she had several children, whose descendants might be interested in seeing her photograph. Ida, whose parents were born in Germany, was born December 1857 in Wisconsin; she married Albert about 1884. Albert was also born in Wisconsin, to parents who emigrated from England. If you have another opinion as to the identity of this particular Mrs. Cook, please contact me.